Hey everybody! 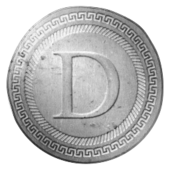 We are doing another Denarius Meme Contest! Contest Guidelines: Make a unique meme for Denarius The meme can be funny, clever, etc. keep it positive The meme you make must be posted here with a link to your Twitter account tweeting it, If you get the most retweets and "Thank You"s here on the forum you and the runner up will win. The contest ends Monday 7/24/2017. The main logo is attached for ease of use in any meme you'd like! One entry per person, no multiple accounts, if you are caught doing so, you will be disqualified and banned from the forums. Whats the prize? 50 DNR to the winner with the most retweets 15 DNR to the runner up with the most retweets 15 DNR to the one that gets the most likes here on DenariusTalk (No retweets required) 10 DNR to my favorite pick (no retweets or likes required)!